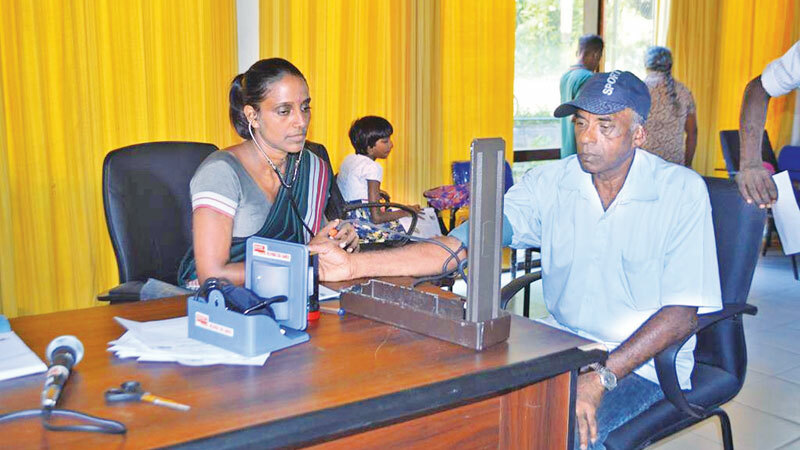 Medical Officer (Non Communicable Diseases) Dr. Erandi Kularathne examining a patient. The officials of Rotary Club of Colombo Uptown (RCCU) including President Nomal Wijeyeratne was also present on the occasion. HelpAge Sri Lanka (HASL) recently partnered with the Rotary Club of Colombo Uptown (RCCU) in a novel project to support vulnerable communities with a special focus on young children and elderly citizens in seven plantation estates at Naarthupana Village in the Kalutara district. Over 150 primary schoolchildren received educational gift packs consisting of school bags, crayons, paints and other stationery items and exercise books whilst over 200 male and female workers and senior citizens were the beneficiaries of the HelpAge Mobile Medical and Eye Camp. Communities from the estates of Neuchatel, Forcester, Hill Stream, Kobowella, Mirishena, Millakanda and Halwathura, managed by Horana Plantation Ltd were assessed by the HelpAge medical team consisting of a general Physician, an Optometrist, nurses and other supporting staff from both HelpAge Sri Lanka and Rotary. Medical support provided by Medical Officer (Non Communicable Diseases) Dr. Erandi Kularathne, received free bifocal spectacles made to the right prescription within a month. Another 44 Elders were referred to the HelpAge Eye Hospital, Wellawatte for free cataract surgery. The total cost of the joint project of school books, mobile medical and eye camp cost over Rs. 800,000. Rotery Club of Colombo Uptown , President Nomal Wijeyeratne thanked HelpAge and Horana Plantation Ltd for coming forward to support Rotary in this project. HelpAge Sri Lanka, Council Member Nishantha Gooneratne said HelpAge Sri Lanka which is a sister organization of HelpAge International, UK is a charitable non-governmental organization working for and on behalf of disadvantaged senior citizens in Sri Lanka to improve their quality of lives.